Hello! Following on from my daytime routine, night-time for me is all about pampering my skin, making sure all makeup is removed and prepped for whatever concoction of serums/oils/moisturisers I decide to use overnight. Starting with cleansing, as it’s one of the most important steps in my skincare routine (I genuinely enjoy doing it, is that sad?). Cleansing oils are big on my list right now and I honestly can’t rave about the Kanebo Sensai Silky Purifying Cleansing Oil* enough. First off, it smells gorgeous, like Nivea hand cream but 10x nicer and warmer, and secondly, it works fantastically to remove everything including waterproof mascara. Amazing. As I always double cleanse and prefer using heavier balms on an evening, I’ll go over with Ren Rosa Centifolia No.1 Purity Cleansing Balm*, removing it with a warm face cloth. It’s so luxurious feeling and leaves skin soft and smooth. The Rosa Centifolia range is new from Ren and, as I adore every product that I’ve ever used (not exaggerating) from them, I’m glad this one is no exception. If my skin is in need of a bit of a clear out or is looking dull, I’ll use a deep cleansing face mask just to give it a boost. 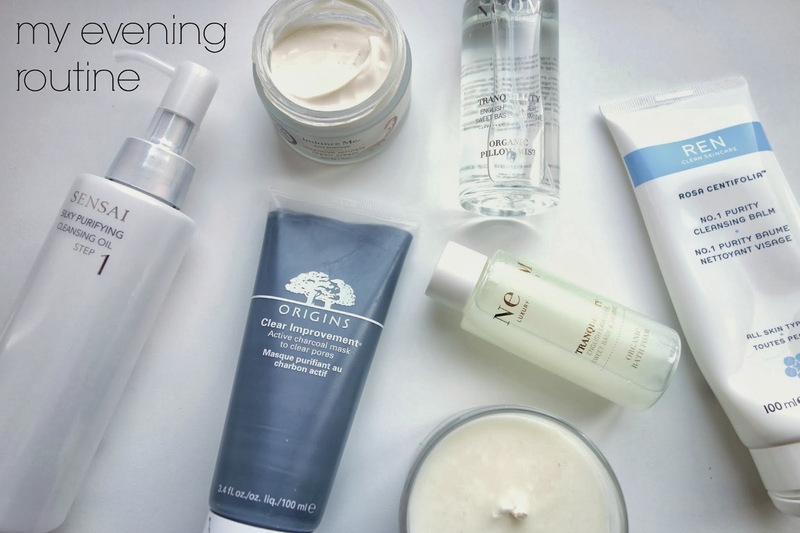 My current favourite is Origins Clear Improvement,which is a charcoal mask that really gets into pores and helps make skin look brighter, clearer and more refined. After all cleansing is done, I’ll opt for an oil or a serum with a moisturiser such as Balance Me Intensive Wrinkle Repair Cream on top. I adore this moisturiser! It’s rich without making my skin oily or congesting it and feels weirdly comforting to apply, like you’re giving your skin a treat. Moving away from skincare, if I’m having a proper pamper night, I’ll opt for the Neom Perfect Night’s Sleep Kit which consists of their famous Tranquillity Candle, Tranquillity Bath Foam and Tranquillity Pillow Mist. The fragrance is all based around lavender, sweet basil and jasmine, but doesn’t have that granny scent you’d expect. It’s very fresh, yet soothing and perfect for helping you drift off to sleep! I just got the mini kit, but the one on the site is full sized (and on offer!) so I’d definitely recommend it. So that’s everything I use on a night at the moment on a basic level, but you can see my favourite oils and favourite serums in those two other posts. Nighttime is when I really concentrate on skincare, so I do spent a lot of time trying new combinations to see what effect they have on my skin. What’s your favourite nighttime product? Any you’d recommend? Let me know below! ps. check out this lovely blog: rosalie jayne!